Founded by Steve Costello and his brother Tim in 1977, Forty West Builders has a storied tradition of building quality homes and providing homebuyers with a personalized experience. Fast forward 40 years to 2017 and these values have been passed along to Steve’s son, Patrick, now the principal partner in the business. At Forty West Builders, we’ve worked with thousands of happy homeowners but we make it our mission to treat every customer like they’re our first. 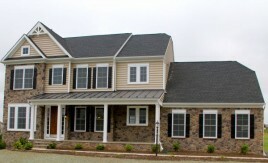 What makes a Forty West home stand apart from other home builders in Maryland? Our functional floorplans, innovative designs, and unparalleled craftsmanship definitely help give us an edge. However, we like to think the experience of our team and our long list of included features are what make our new homes exceptional. We have the trophy case to prove it with dozens of awards from the Maryland Building Industry Association. For us, it’s all about the customer experience. Our home styles are as individual as you are and our unique construction process allows you to personalize our floor plans to match your tastes. So go ahead, add another bedroom, expand the size of the living room, build a wet bar for entertaining, or even add a detached dwelling… Forty West can make it happen. We’ll be there for you and your family long after the boxes are unpacked. Our comprehensive Home Owner’s Manual not only puts our guarantees and service commitment in writing but also describes necessary maintenance steps you can take to enhance the value of your home. When it is all said and done, you’ll see our commitment to customer satisfaction every step of the way. At Forty West Builders, we aren’t just building homes, we’re creating neighborhoods where comfort blends easily with convenience. Forty West is a better way home.